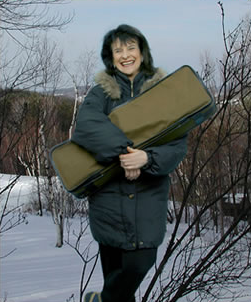 Violinist Linda Rosenthal has performed throughout North America, Europe, and Asia in recitals, as soloist with orchestras, and as a chamber musician. Based in Juneau, Alaska, Rosenthal has performed in virtually every corner of the State, from logging camps in the Panhandle to tiny villages above the Arctic Circle. She also tours extensively throughout the U.S., frequently under auspices of the N.Y.-based Piatigorsky Foundation, whose mission is to send its artists to populations that have little or no exposure to live classical music. In 1995, commissioned by the Kennedy Center, Rosenthal created and premiered Strings & Stories, a 2-person show for young audiences that she and L.A. actor Bill Blush continue to perform annually for thousands of children across the country. Rosenthal is Founder and Artistic Director of the Lake Placid Chamber Music Seminar and Founder and Artistic Director Emeritus of the Juneau Jazz & Classics Music Festival. She has recorded 5 solo CDs and commissioned and premiered more than a dozen works. Rosenthal plays on a violin made in 1772 by J.B. Guadagnini. Download a PDF of Linda’s bio, or visit the press page for more download options.